It's probably about 10 years since I last watched Scorsese’s classic, and it remains a gripping immersion into a damaged psyche. It's easy to see why some have categorised this as a horror film and others as science fiction. Bickle's as much an alien in the New York landscape as Bowie's Man Who Fell to Earth, and the way Scorsese films the lurid, fractured world owes a debt to the under-the-skin paranoia of the likes of Polanski's Repulsion and Rosemary's Baby. Added to that, Bernard Hermann's score is deeply unsettling. On the lighter side, Albert Brooks' party worker is a hoot, which is not surprising as Brooks improvised the dialogue himself. 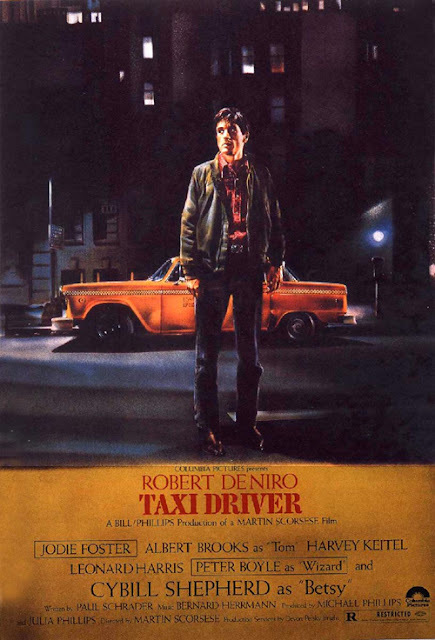 I hadn't noticed before that Scorsese appears twice in the film; in the cab sequence, obviously, but also sitting on some steps in a street scene.